It is extremely easy to turn the blouse into the dress. Cut the front and back pieces apart somewhere in the lower third of the pattern piece, put a piece of paper under the pattern pieces, spread the pattern pieces apart until you reach the desired length. Tape to the paper underneath, smooth the side seams and you are all good to go. The sleeves are shortened as well, mostly because I didn't have enough fabric. That's the story of my life. Evelyn chose the fabric and the buttons. I think it's super sweet, maybe to sweet, but she loves it. The fabric is from Cotton+Steel. Can't remember the collection now, it's an older line. I also added shirring to the sides to cinch it in a bit. 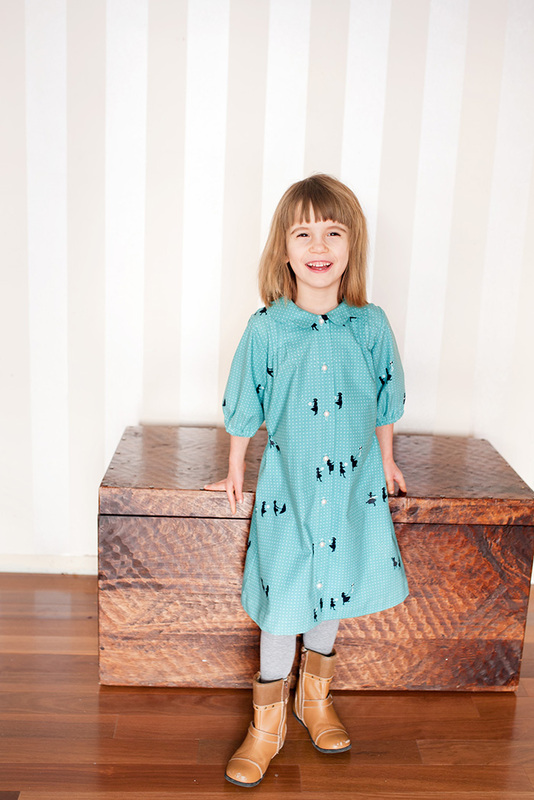 I love shirring, it's so quick and easy to do! It does help to mark lines where the shirring goes on the pattern piece and then transfer the markings to the fabric. 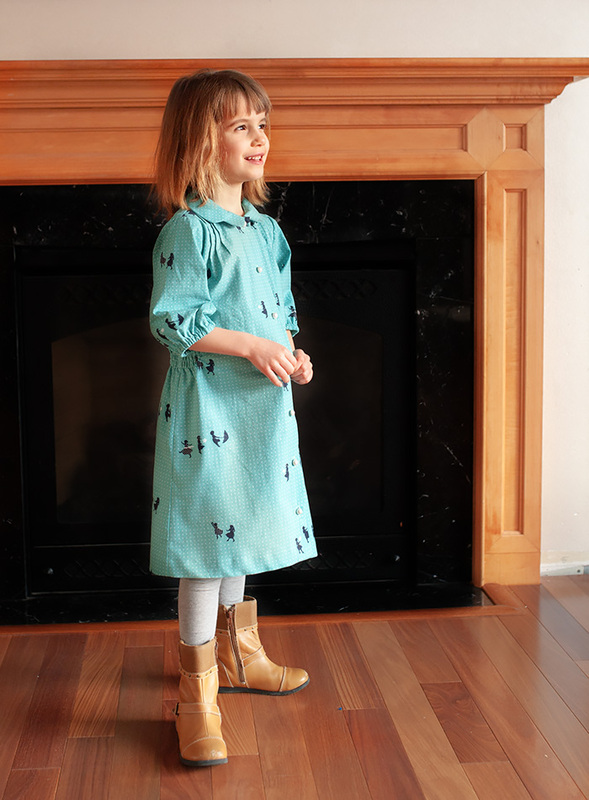 Instead of lines of shirring you can add a casing and thread elastic though it, or just sew narrow elastic to the dress. If you want the line to look straight across the back, it's important not to sew straight across the back or it will look as if the elastic/shirring is riding up. Instead lower it by about 3/8in (1cm) at the center back and smooth it as you go to the side seams, so the the line is lower at the center back than it is at the side seams. That way it will look as if the line goes straight across the back when the dress is worn. See the picture below for the illustration. Evelyn loves her new dress. It's comfy and cute and she certainly enjoys all the compliments she has been getting. Join the Coffee+Thread Patterns Facebook group to get a 10% discount code. 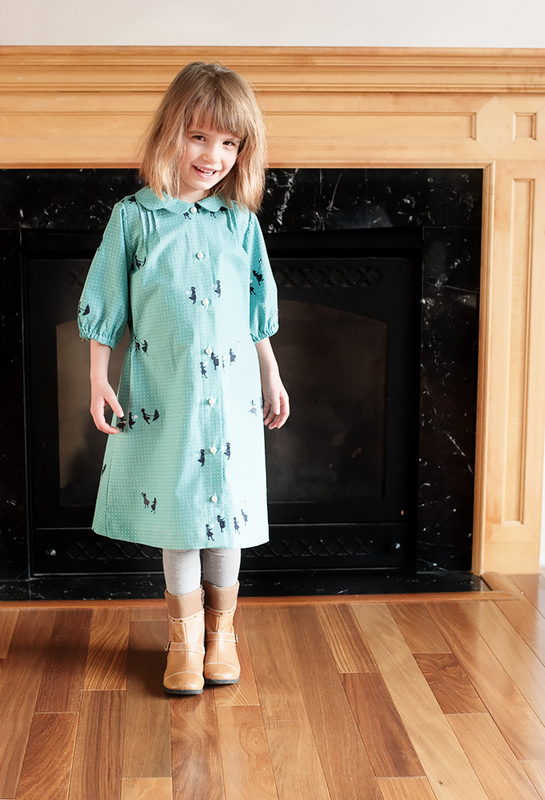 I love it as a dress - this might be the perfect solution for my daughters as well since they love wearing dresses. The shirring adds such a great touch! Very sweet! I think the sleeve length is perfection! It does look like such a comfy dress! Love the fact she was so involved in the process! I have been letting my 2 y.o. choose fabric... so her wardrobe is full of blue hahaha I love this blouse pattern Olga. It has such sweet details! I want to live with you and have you sew my clothes. You're amazing.